The remains of an unfortunate soul were found in the cracked bonnet of a Shinkansen bullet train in Japan. The Nozomi No. 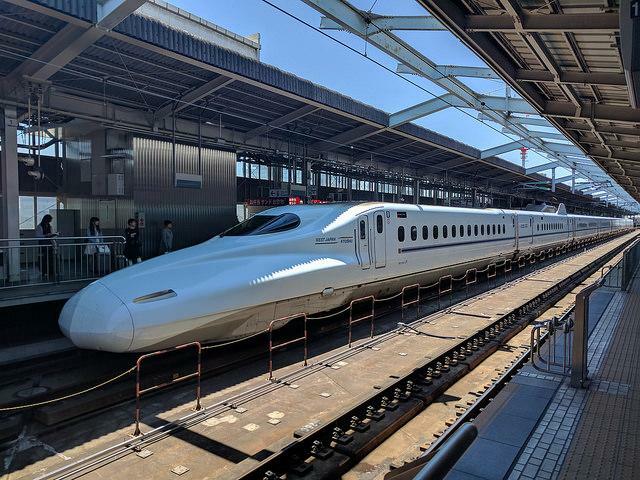 176 Superexpress Shinkansen headed to Tokyo from Hakata was carrying 200 passengers when the discovery was made at a regular stop at Kokura Station in the city of Kitakyushu. The damage notice at the stop was a large crack in the train's bonnet but it was not considered serious enough to halt its journey. Upon arriving at its destination, it was inspected further and human body parts were found in the cracked portion of the train's nose. Trains that run both ways on the Sanyo Shinkansen line between the cities of Hiroshima and Hakata were immediately canceled for the rest of the day. The discovery caused extensive delays to other services including the Kyushu Shinkansen and the Tokaido Shinkansen. All 200 passengers and crew members aboard the damaged 16-car bullet train were uninjured in the event. A statement from West Japan Rail said no abnormality other than the exterior damage could be found. This is the reasoning which allowed the driver to continue to the mainland with human remains stuffed in the front of the train. Fukuoka Prefectural Police reported finding multiple body parts near the Ishisaka tunnel in the prefecture's Yahata Nishi Ward. Upon questioning, the train's conductor admitted to hearing a strange noise at the time the train passed through Ishisaka tunnel but did not find it significant enough to make a report. A miscommunication between those who inspected the exterior damage and the station attendant who checked on the passengers led to the attendant being unaware of the damage. According to a spokesman for JR West, the train's conductor had hit small animals in the past and made the decision not to stop the train at the time because there was no perceivable risk to passenger safety. He assumed it was another small animal and concluded it was not necessary to stop the train for safety reasons. Another spokesperson said the train should have been stopped and inspected and they will be updating training so staff will take the correct measures in the future. Youtuber seeking a vid, a Tunnel Rat or Homeless person take your pick. Either way he/she/it is now of the tracks. The person at the controls is NOT the conductor. He may be called operator, driver, engineer, or motorman, depending on the system.